We’d love your help. Let us know what’s wrong with this preview of Babylon Rising by Tim LaHaye. Tim LaHaye created the Left Behind Series, which has become one of the most popular fiction series of all time. Those novels, with more that 50 million copies sold, presented a unique combination of suspense and substance drawn from his lifelong study of Biblical prophecy. Now Tim LaHaye has created a new series that begins with Babylon Rising. The novels in this new series Tim LaHaye created the Left Behind Series, which has become one of the most popular fiction series of all time. Those novels, with more that 50 million copies sold, presented a unique combination of suspense and substance drawn from his lifelong study of Biblical prophecy. Now Tim LaHaye has created a new series that begins with Babylon Rising. The novels in this new series are even faster-paced thrillers based on prophecies that are not covered in the Left Behind books and that have great relevance to the events of today. Babylon Rising introduces a terrific new hero for our time. Michael Murphy is a scholar of Biblical prophecy, but not the sedate and tweedy kind. Murphy is a field archaeologist who defies danger to fearlessly hunt down and authenticate ancient artifacts from Biblical times. His latest discovery is his most amazing—but it will send him hurtling from a life of excavation and revelations to a confrontation with the forces of the greatest evil. For the latest secret uncovered by Michael Murphy accelerates the countdown to the time of the end for all mankind. To ask other readers questions about Babylon Rising, please sign up. How can i read it? what am i going to click?? Christian 2014-2015 Fiction You Can't Wait To Read! Babylon Rising is an adventure featuring Michael Murphy, an Indiana Jones-like character who is an archaeologist, Bible scholar, and professor all rolled up into one manly man. Unlike Indiana Jones, Murphy's main passion in life is to seek out real artifacts to support the writings in the Bible. The story begins with Murphy engaged in an deadly challenge to obtain an archaeological artifact which gives him some valuable clues about a bronze serpent reputed to be from the era of Daniel. While ther Babylon Rising is an adventure featuring Michael Murphy, an Indiana Jones-like character who is an archaeologist, Bible scholar, and professor all rolled up into one manly man. Unlike Indiana Jones, Murphy's main passion in life is to seek out real artifacts to support the writings in the Bible. The story begins with Murphy engaged in an deadly challenge to obtain an archaeological artifact which gives him some valuable clues about a bronze serpent reputed to be from the era of Daniel. Currently I am on page 129 of Babylon Rising. Something that has stuck out so far in this book is the main character Michael Murphy. I admire him the most because he sticks to his faith no matter the circumstances. He has been faced with many tough challenges including going against a lion, ridicule for his faith at the college he teaches at, and potential loss of job, and yet he still keeps a positive attitude and his face looking up. Even though this book is fiction, his motivation to live out his faith gives me energy and encouragement to live out mine. Hooray! The Christian Right has found a charismatic professor/hero who saves the world from the evil international group conspiring to unite the world under one global order... under Satan! Part Indiana Jones, part Robert Langdon, and 100% evangelical Christian, Michael Murphy fights intolerant college administrators, the manipulative mass media, and a very, very evil man with a fondness for falcons while trying to prove the truth and prophecy written in the Bible. This is a good alternative read Hooray! The Christian Right has found a charismatic professor/hero who saves the world from the evil international group conspiring to unite the world under one global order... under Satan! Part Indiana Jones, part Robert Langdon, and 100% evangelical Christian, Michael Murphy fights intolerant college administrators, the manipulative mass media, and a very, very evil man with a fondness for falcons while trying to prove the truth and prophecy written in the Bible. This is a great book for someone who likes archaeology (like me)! Besides the suspense, I kept reading to find out if they would be able to get the wanted artifact. The entire Babylon Rising Series is good! Even if you absolutely hate books, you most likely have heard of the Left Behind series. For many people, that bestselling apocalyptic saga is all they have experienced and/or know of when it comes to the world of Christian fiction. That's actually a shame, in my opinion; although the story contained in those books is good, Jerry Jenkins' shoddy writing style made it hard for me--a longtime reader of Christian literature--to stomach even three books' worth, which amounts to less than twenty-five Even if you absolutely hate books, you most likely have heard of the Left Behind series. For many people, that bestselling apocalyptic saga is all they have experienced and/or know of when it comes to the world of Christian fiction. That's actually a shame, in my opinion; although the story contained in those books is good, Jerry Jenkins' shoddy writing style made it hard for me--a longtime reader of Christian literature--to stomach even three books' worth, which amounts to less than twenty-five percent of the series. Not only that, but there are much better Christian novelists--Melody Carlson, Frank Peretti, Bill Myers, Rachel Hauck, Bodie and Brock Thoene, Janice Thompson, etc.--that don't have the name recognition the Left Behind authors have. After reading that, you might expect me to give Babylon Rising a negative review, but I won't, because it actually was very good. Although it was created by Tim LaHaye, who also created Left Behind, Greg Dinallo's wordsmithing is far superior to Jerry Jenkins' any day of the week. This is actually my second time reading it; I found the entire series at a yard sale a few years ago, and found the entire series to be riveting, especially the last two or three volumes. This introductory novel doesn't have as much action as the latter three volumes, but that's only because LaHaye and Dinallo need to set up the story for the later volumes. Think of this one as the backstory for a video or computer game as told through an opening cinema sequence or in the game's manual; it may not be as exciting as actually playing it, but you need it to understand how to reach the ending. I though it was cool that an author could think of two different alternatives to the end times. I would write just one and stick with it....he's must have a good imagination. I personally loved the book. The pacing was great, and the first chapter grabbed you by the hand and took you in! The pyramid of the wind was totally cool. And Methusalah (sp?) sounded kinda creepy...I wonder how he got all of his artifacts? The golden serpant was a need idea, but the idea that the statue of the King of Babal I though it was cool that an author could think of two different alternatives to the end times. I would write just one and stick with it....he's must have a good imagination. The golden serpant was a need idea, but the idea that the statue of the King of Babalyon was weird. Personally, if I knew that someone could become evil and end the world with it. I would hide it after I found it, not put it on display like Murphy did. This review has been hidden because it contains spoilers. To view it, click here. One of the problems with Christian thrillers is that the bad guys aren't too bad, but the good guys are sugary sweet. They are completely unrelatable to people in the real world or the Bible. The Bible is filled with flawed people chosen by God to complete some task. This book is not as good as the Left Behind series. I, as the reader, simply don't care what happens to the main characters. They will win in the end, but there is not enough suspense to make me read 3 more books. I apologize in advance for the length. You have been warned (or challenged, if you prefer). 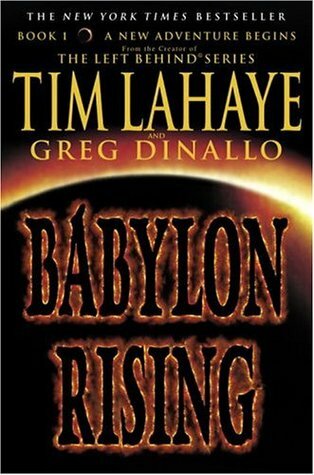 Babylon Rising is Tim Lahaye's fictional account of a Biblical archaeologist who gets caught up in his own series of unfortunate events in search of a mysterious Biblical artifact that can prove the credibility of the Bible. Along the way, however, he not only discovers that this artifact holds a secret that is darker and more ancient that he realizes, but also that there are those following his every step I apologize in advance for the length. You have been warned (or challenged, if you prefer). Babylon Rising is Tim Lahaye's fictional account of a Biblical archaeologist who gets caught up in his own series of unfortunate events in search of a mysterious Biblical artifact that can prove the credibility of the Bible. Along the way, however, he not only discovers that this artifact holds a secret that is darker and more ancient that he realizes, but also that there are those following his every step that will stop at nothing to take this artifact for themselves. As a Christian alternative to today's literature, this book provides an exciting story that combines adventure with Biblical truth. In third person fashion, Lahaye jumps not only between the worlds of the characters involved in the story, but also between our time and that of ancient Babylon--providing extra substance to the overall story. He also incorporates casual mentions of God, and sermons and lectures that might inspire the reader to feel as though he/she has stepped into the halls of a seminary. All of this with the Indiana Jones-inspired adventures of Michael Murphy, who manages to escape death at least three times with margins that only narrow as the book continues. As I previously mentioned, this book is a great Christian alternative to literature. However, as a literary piece itself, I was not as thrilled. This book contained an inconsistent tone, several dull moments which seemed irrelevant to the story, and a plot which, although good in itself, was underdeveloped and filled with hidden interests of the author. From the very first chapter, Lahaye really knows how to create a suspenseful tale. Murphy is immediately framed as an adventurous man with physical endurance enough to support his dangerous habits of going after vague clues in search of a desired artifact. This works well to grasp the reader's attention as Murphy encounters his first adventure--and first clue. The tone in this segment reflects one focused heavily on events, without as much interest as development in the story line (which is appropriate, given the events that occur). I was pleased to see that, in the next chapter, as the scene changes to Babylon, the tone was adjusted to one which had more style and allure. As he explored the other characters, he also used tones appropriate for them--the ruthless businessman, the sadistic tormentor, and the mysterious men who ruled both of them. While I believe the character development could use a little more work in regards to personal history of each character, I can understand that this story did not necessarily see such things as a priority. By about chapter five, it became evident to me that the author was comfortable with creating brief sporadic moments of suspense to add to the story. This began as a great technique to build excitement within the text. However, he also grew too comfortable with 3-5 page chapters which, while explaining all that was necessary to the story line, did not take the time to develop as many elements of tone that I would have liked (such as the more complex aspects of emotion and thought processes of each character). He often left character development up to dialogue, rather than taking full benefit from the advantage of third person. Although I must appreciate the times when character development was complete (which was primarily early on), I wish that I would have been able to see such development and character change as the story changed. Much of the substance within the chapters between ten and thirty contained more information than plot. With the exception of chapter 18, these were some of the slowest chapters of the book. While I understand the need for plot development, I sometimes wondered at this reasoning. Along with dull development, Lahaye makes no secret of his stance (or even what he does for a living outside of writing). Devoting entire chapters to Biblical archaeology lectures and other sermons, I found his attempts tiresome. The lectures often repeated information that was already stated to the reader, and the sermons teetered on the balance between being too short (as to not thoroughly explain its purpose) and simply being overly "preachy" (for lack of a better term). As a Christian myself, I applaud Lahaye's vision of his evangelistic opportunities through this book. After a while, though, I felt that it may have been too much, and could inevitably keep some non-Christians from reading some of his other books if they find his approach uncomfortable. I appreciate what Lahaye wants to accomplish--but sometimes subtlety is more effective. I will say that the book did begin to pick up around the thirty's chapters (30-39), which is what carried me through to the end of the book. I feel as though these chapters (and the rest of the book) did wrap up nicely and make up for the moments of dullness. Although the ending was a little disappointing, I realized that this was the best that I could hope for with a book that was the first in its series. I gave it 3 out of 5 stars. I liked it will enough to read it and even recommend it to someone looking for an exciting story with heavy Biblical undertones. I did not like it enough to recommend it to someone whom I know is looking for flow and style. I love the idea of this series of books. Relearning the bible stories a different way is cool. But there is something that makes me dislike the author. I have read a few books from this series and what bugs me so much is the "voice" he uses with the character of the main character's assistant. It's almost as thigh he makes her act dumb because she is a woman. He describes her as really smart but the things that he has her say are insulting to the intelligence he presents her with. Eh. It has potential but I really didn't like how everything seemed to come so easy to the main character. He wanted to find something, and he did. There was action, adventure and love lost...all features of a great book...but I think there should have been more struggle. Great story. Loved it will download book number 2 today. Tim LaHaye is one of my all time favorite authors!!!! It only took me 2 days to read this one. I just couldn't put it down, I was hooked. The story line was great and I thought it proceeded at a nice quick pace. This was an exhilarating book. Looking forward to the entire series. Murphy is an interesting character. The ending was a cliffhanger. The narrator was excellent as well. Binnen de Christelijke wereld is de serie 'De Laatste Bazuin' van Tim LaHaye en Jerry B. Jenkins een begrip en het is zelfs een hype geweest. Er zijn zo'n 80 miljoen boeken van deze serie verkocht en zijn bestsellers geworden. LaHaye, een dominee uit San Diego, Californië schreef naast deze invloedrijke serie nog veel meer boeken. Naast de fictieve boeken, waar hij om bekend staat, ook meer dan 60 niet fictieve boeken over heel veel verschillende onderwerpen, maar, zo zegt hij zelf, schrijft hij het liefste over Bijbelse profetie. Het boek begint snel zonder rekening te houden met de lezer bij een mysterieuze ontmoeting met een man die zich 'Methusalem' noemt. De held van het verhaal, Michael Murphy, moet een test doorstaan om een belangrijk artefact in handen te krijgen. Wanneer Murphy ook deze testen doorstaat krijgt hij een deel van de gouden slang uit Numeri 21:4-9. Hij gaat op zoek naar de echtheid van dit artefact om op deze manier de Bijbel te bewijzen. Om het tweede stuk in handen te krijgen haalt Murphy vele capriolen uit. Met behulp van zijn vrouw,Laura Murphy, en professor Isis McDonald komt hij uiteindelijk achter de plaats van het derde stuk, maar zo gemakkelijk komt hij niet aan het derde en uiteindelijke deel. Er zijn meer mensen op zoek naar deze artefacten, namelijk de Zeven. Dit duistere en geheimzinnige genootschap wil het gebruiken om duistere machten los te laten en zo Babylon te laten herrijzen. Dit genootschap gaat letterlijk over de levens van mensen. Met McDonald gaat hij op zoek en vind hij ook het derde stuk, maar ook de handlanger van de Zeven komen ze in het heetst van de strijd tegen. Gelukkig helpt de moderne apparatuur van Murphy om achter de grote schat te komen. LaHaye gaat in op de profetieën van het omstreden Bijbelboek 'Daniël' en daar waar hij in de serie 'De Laatste Bazuin' schreef in de toekomst, schrijft hij 'Babylon' in het heden. Hij gaat door in het thema van de eschatologie van 'De Laatste Bazuin' met daarin de boodschap dat de Openbaring van Johannes dichterbij is dan ooit en dat we op de vooravond staan van grootste veranderingen. Hij schrijft vanuit zijn visie over Daniël. Hij zet hem neer als een echte, ooit bestaande profeet, waarbij er nog profetieën werkelijkheid moeten worden. Dit is een aspect dat niet door alle theologen word ondersteund. Dit boek is een roman over het uitkomen van wat deze profeet heeft gezegd, wat het voor vele Christenen een aantrekkelijk boek word. Tevens wordt zijn ideeën over een globale samenzwering duidelijk uiteengezet, waarbij de Zeven een archetype hiervan is. Diverse bronnen op het internet schrijven dat LaHaye in het boek Rapture Under Attack schrijft over het bestaan van de Illuminati. Hij is er van overtuigd dat deze groepering een realiteit is en de bron is voor vele onmenselijke acties in de laatste 200 jaar. Deze overtuiging komt heel duidelijk naar voren in het boek 'Babylon'. Door deze visies wordt de boodschap van de eindtijd vanuit het perspectief van de Evangelische Christenen, namelijk de wederkomst van Jezus en de toorn van God die over de aarde komt als climax van deze wereld, heel duidelijk. Het boek verwijst naar een plan van de Zeven die ondanks het 'falen' in dit deel toch echt wordt nagestreefd. LaHaye neemt de lezer, mijns inziens, succesvol mee in de avonturen van de Bijbelse Indiana Jones. Het boek gaat verder dan de Bijbel en maakt stoffige geschiedenis tot een spannend goed. Als Evangelisch Christen sta ik achter de mening dat Daniël een profeet was, waarvan nog voorspellingen van moeten uitkomen en ik deel de mening over de eindtijd. Als ik kijk vanuit de doelgroep, Evangelische Christenen, is dit boek zeker interessant. Vooral in de zin vanuit het beeldend maken en een hedendaagse weergave geven aan diverse eschatologische boeken. Vanuit mijn achtergrond vind ik het een interessant boek voor niet-gelovigen of anders gelovigen om een kijkje te nemen in een van de visies van de toekomst die bestaat onder de Evangelische Christenen. Het is een interessant en leuk boek, maar bij tijd en wijlen mis ik snelheid in het boek. Soms gaat de lijn heel snel en andere momenten is het verhaal droog en traag. Dit droge en trage word versterkt door de grote hoeveelheid vlakke karakters die LaHaye gebruikt. Mede daardoor geef ik het boek maar 3 sterren. Bij het einde van het boek vond ik hem goed genoeg om het volgende deel te lezen, maar dat deel moet de serie bewijzen. Tim Lahaye has written a wonderful start to a series called Babylon Rising. In this first of the series you meet biblical archeologist Michael Murphy. Professor Murphy is known as finding proof that the stories in the Bible are true by finding artifacts that are mentioned in it. Murphy gets a clue on one of these artifacts and goes on a wild and dangerous adventure to locate it. This book definitely keeps you turning the pages for more! Reading more like a first draft of a cable-TV movie, authors Tim LaHaye and Greg Dinallo pen an incredibly disjointed thriller which features an implausible plot and incredibly wooden characters. If you like heavy-handed, moralistic messages, this book may be right up your street. But if you are someone who looks beyond the obvious and seeks to find answers in a more subtle or enlightened way, don't bother with Babylon Rising. Giving this book 5 stars because I enjoyed it immensely and jumped right into Book 2. My only criticism is that the final several scenes happened so quickly, and predictably, that I felt like I didn't have time to invest in the action. With 50 pages left, I was wondering how the final two mini-adventures were going to fit. They did, but they felt rushed. I was expecting a lot more. It was average writing and I thought it would really have me opening my bible and having me compare truth. Maybe the next book will. Seemed like I was doing a lot of that in the Left Behind Series. Always loved archaeology when I was younger and it is exciting to see it explored to prove prophecies of the ancients are true, especially, Daniel. I know this is only fiction, but it brings to light many of the things we have to look forward to. I am a fan of Tim LaHaye. I enjoyed reading this book because it was very entertaining. I thought the novel was well written with plenty of action. The book was fast paced tale of history, intrigue, and religion. It kept me on the edge of my seat. I would recommend it because of the awesome story. I loved the back and forth of the battle between good and evil, and I will certainly read the next book. I was however really disappointed in the missing words, misspellings and name changes of one of the main characters. I expected more. Tim LaHaye is as usual great at combining Biblical facts in a fictional setting . his Left Behind series flew off the shelves and this series will too. The LORD is using his talents in. Mighty way. This book is just awful. The writing is awful. The characters are awful. The editing is awful. This story might have been believable except that these magnificent discoveries seem to come too easily and quickly for ole Michael. Fun to read but just not believable.